Synopsis: After the world merge, demon possessed people are popping up again. Oh boy. Here we go again. Who is doing this now? Duration: February 2017 - . After the world merge, DemonInfest start making appearances once more. Three DemonInfest are deposessed in Central Park by Jenny and Phantasm. After confirming with contacts elsewhere in the world that the DemonInfest appear to be targeting magic users for erradication, Phantasm reaches out to Dr. Strange to open up a line of communication with magic users from the new world. Raven is the first to be contacted. Mike starts up training sessions for magic user agents currently stationed at SHIELD headquarters on how to temporarily imbue exorcism magic into escrima sticks so they may teach it to other magic users at other locations. Where are the Winchester brothers when you need them? Want to fight demons and demon infest but can't find a staffer GM? Well no worries! Below are the things you need to know to do your own mini scene battling these guys. Demons - We're talking low level here. High enough to cross over to this plane and not require a host body to anchor themselves but low enough to not even merit being named by Marvel writers. DemonInfest - A step below the demons, these are the demons that required assistance getting over by making use of host bodies. DemonInfest - Enhanced agility, reflexes, speed, and strength. Also whatever abilities and skills the host bodies came with. They want to get more of their buddies over to this side, so they're looking to collect host bodies ALIVE and take them over to the folks who are helping them put their buddies into the hosts. 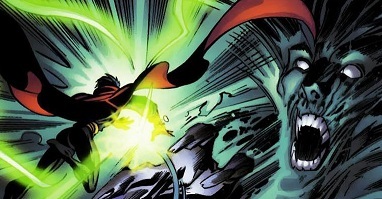 There is a preference for mutants and meta-humans, or untrained humans with traces of magic ability to them. Trained magic users they prefer to kill now as past experience has established them to be a threat. 4) What are their weaknesses.